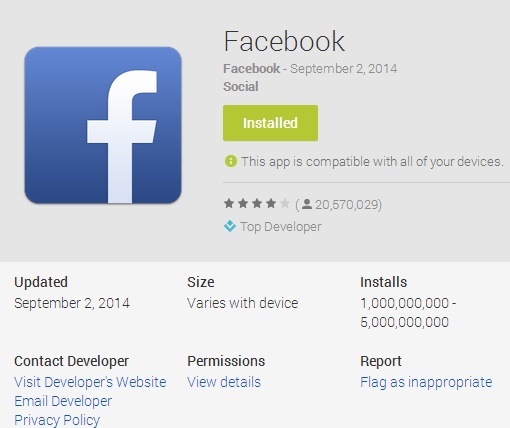 Facebook app for Android is the first Non-Google Android app that has hit the billion milestone. The only app that has been downloaded billion times before Facebook was the Gmail Application. It’s acceptable that Gmail being a product of Google has gained so much popularity and Gmail comes by default in Android handsets. But Facebook being an outsider has had equal dominance when it came to the whopping number of times the app has been downloaded from the PlayStore, 1 billion. Gmail has received world wide appreciation because of its fluid design, colorful User interface, sections separating important, Promotional and Social mails. Besides this app lets you manage multiple accounts, set up label notifications, view and save attachments and integration with Google Drive. The app gets updated every month and gets better with each update. The Facebook app for Android has several new features almost every feature that is available from desktop. you can post photos, videos, share them with friends. You can also create your professional or social Facebook page and interact with people, boost you product and so on.